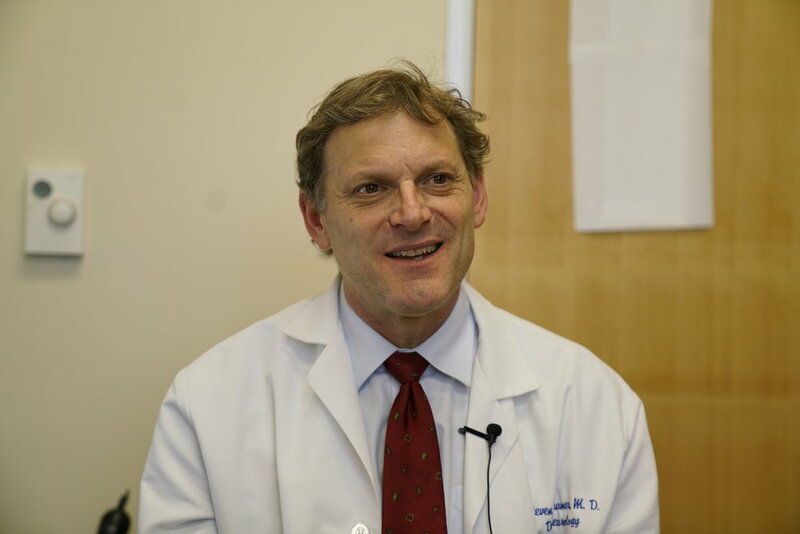 “Stroke is a major cause of human disability and we are trying to come up with ways of giving people a larger dose of rehabilitation therapy, especially in the home, in order to reduce disability after stroke,” Dr. Steven Cramer said. Cramer’s lab developed a home based tele-rehabilitation system that uses gaming to restore patient hand and arm function after stroke. Although rehabilitation therapy is commonly provided after stroke, many patients don’t get the benefits they need to truly regain function because of lack of access to therapy, high cost of therapy, and compliance issues. Cramer combined his medical knowledge with his earlier experience as a gamer to create a gaming station that could help stroke patients practice movements and regain function. 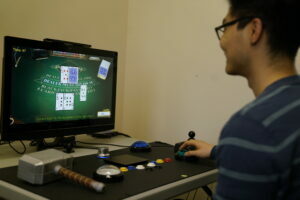 The device, on which stroke patients can play games like “whack-a-mole” with a plastic mallet, was produced by a multidisciplinary team of rehabilitation, occupational, and physical therapists, as well as experts in neurology, gaming, motivational psychology, and computer programming. Patients use the system under video conference supervision by clinicians at remote locations. “It provides a framework for exercises, for therapy, and also for education so that we can maximize prevention, to prevent the kinds of complications anticipated after stroke such as another stroke, a heart attack, or depression,” Cramer said. A patient is first evaluated for appropriateness for the program by a licensed therapist. The therapist enters examination results into a program which produces a customized 80-minute rehab session itinerary. The therapist can further adapt the program for the patient by dragging games or exercises onto the screen or modifying their difficulty or duration. The therapist then sends that treatment plan to the patient’s screen at home where the system, involving computer and a wireless modem, has been delivered. The patient has an agreed-upon daily start time with the therapist. During the hour prior to that, the system flashes and emits noises. “It is all highly structured,” Cramer said. “The patient cannot use this as a computer. There is no keyboard. It is designed as an appliance.” Cramer emphasizes that patients don’t need any computer skills or literacy to use the system – they only need to be able to push a button. The therapist decides in each session which movements the patient needs to practice. The movements are gamified. “If we want the patient to practice arm extensions, target arm movements, visually guided arm movements, reaching movements, we design the whack-a-mole game,” said Cramer, who proceeded to whack at buttons that lit up in succession with a plastic hammer, racking up points. The system provides the therapist with automated feedback. The therapist can see the patient’s score, a graph of scores over time, and a graph of successive scores over time according to the level of difficulty that was assigned. The therapist can then revise the settings in terms of duration or difficulty. According to Cramer, patients need to have some minimal amount of language function to understand the directions. They also need to have sufficient communication skills to report if they are in distress, pain or have another problem. Other than that, they just need to be able to follow the few basic instructions that appear on the screen. The system has both supervised and unsupervised sessions. During the unsupervised sessions, patients work through an 80-minute assignment, including a 10-minute break. The system allows working intermittently so patients can take bathroom breaks or go shopping, for example. There is no interaction with the therapist, unless there is a problem. “We always have a mechanism to call in if there is an issue,” Cramer said. Channeling the expertise of the therapist. “Here we get into what makes a good therapist,” Cramer said. “It involves the human factor as well as understanding the medical science and the skill to implement it. We think we have retained all of these to some important degree in the design of this system.” The therapist has discretion in knowing what exercises to assign, and how to best coach the patient and review progress through video conferences. Cramer is conducting an National Institutes of Health (NIH) funded six week, 12-site clinical trial of the current telerehab-therapy program, dose and intensity-matched with traditional in-clinic rehabilitation, based on the encouraging results of a prior 28 day pilot study. The study, conducted through the new NIH clinical trials network for stroke, Strokenet, consists of three supervised and three unsupervised sessions of 80 minutes duration per week. Each 80-minute session consists of games, exercises, education, some assessment modules, and a 10-minute break in the middle. The patient does daily sessions six days a week. Seventy-nine patients are so far enrolled in the study, which is slated for 124 patients. “We hope to have an answer before the end of 2017 as to whether this tele-rehab approach in the home is as good as what a therapist does in the clinic,” Cramer said. The study’s primary endpoint measures arm movement capacity that captures weakness, coordination, precision, timing, and strength, using the Fugl-Meyer Scale (so named after Axel Fugl-Meyer, the Norwegian rehab specialist). “The Fugl- Meyer Scale tells us how somebody’s arm is in terms of 0 being poorest to 66 being normal,” Cramer said. The next step for Cramer’s team is writing grants to fund the next study to see the effects of larger rehab therapy doses for longer periods of time in more heterogeneous populations. “Possibly including going beyond stroke because a lot of the things we are doing here — in terms of better exercise, better activity, better function, better reserve, better cognitive activity, better education, mood screenings, and so forth — is directly important to patients who have had a heart attack, patients who are healthy 75 year olds, patients who have renal failure, patients who have major depression,” Cramer said.